Score after 34.5 overs, India 156-2, Rayudu 13*, Dhawan 75*; Lockie Ferguson 1/41, Doug Bracewell 1/23. 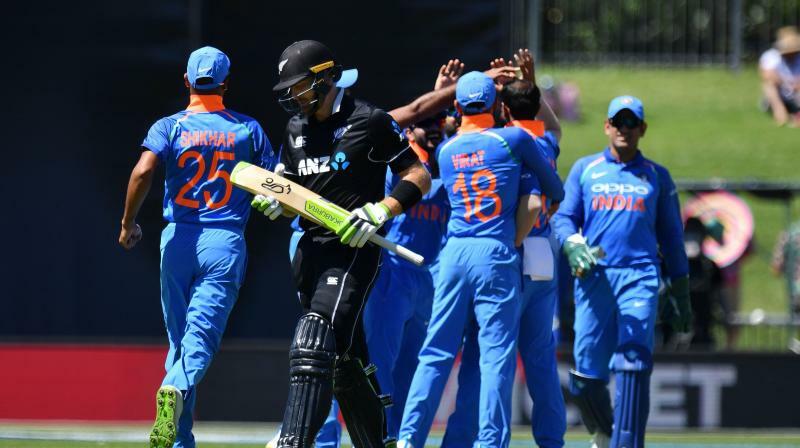 Napier: Shikhar Dhawan and Virat Kohli guided India in their comfortable eight-wicket win against New Zealand in the first ODI here on Wednesday. The visitors now take a 1-0 lead in the five-match series. Earlier, the Kiwis were bundled out for just 157 with Kane Williamson (64) being the lone fighter. Kuldeep Yadav shone with the ball, finishing with a spell of 4-39. Meanwhile, Mohammed Shami became the fastest Indian bowler to 100 ODI wickets after dismissing Martin Guptill earlier in the match. In reply, the Men in Blue got off to strong start but lost Rohit Sharma for just 11 runs. However, in a rare incident, play was halted in the 10th over, an over after the dinner break, due to an excessive sunshine on the batsmen’s eyes. As a result, play was suspended for half an hour after which the game was reduced to 49 overs, with India needing 156 to win. With victory in sight, Lockie Ferguson got a consolation when he dismissed Virat Kohli for 45 runs in the 29th over. WICKET! Captain Kohli departs for 45 runs as Tom Latham completes the catch behind the wickets to gift Lockie Ferguson the wicket. New Zealand were on Wednesday bowled out for just 157 runs with Kane Williamson (64) top-scoring for the hosts in the first ODI against India. Kuldeep Yadav had figures of 4-39, whereas Shami had figures of 3-19. Only five batsmen registered double-figure scores, with even Martin Guptill and Colin Munro failing to get off to strong start. By picking up the first wicket of Guptill, Shami became the fastest Indian bowler to pick up 100 ODI wickets. He achieved this in his 56th ODI, surpassing Irfan Pathan, who took 59 matches to do so. WICKET! Vijay Shankar takes a catch at long-on as Kuldeep Yadav sees off captain Kane Williamson for 64 runs. Two-in-one-over! Doug Bracewell is clean bowled by Kuldeep to put Kiwis in deep trouble. WICKET! Kiwis lose their sixth as Santner is struck lbw by Shami. FIFTY! Kane Williamson gets to his 36th ODI half-century. Can he get the hosts back on track? WICKET! Kedar Jadhav strikes as Kuldeep Yadav completes the catch at midwicket to dismiss Henry Nicholls for 12 runs. WICKET! Chahal does everything right as Tom Latham is caught and bowled by the bowler for 11 runs. Caught and bowled! Yuzvendra Chahal strikes as he gets the crucial wicket of Ross Taylor, who departs for 24 runs. BOWLED 'EM! Mohammed Shami goes round the wicket as Colin Munro is dismissed. Kiwis off to a forgettable start here. BOWLED 'EM! It's ODI wicket number 100 for Mohammed Shami as he removes Martin Guptill early. Dream start for India. After a historic tour to Australia where India drew the T20I series and won the Tests and ODI series, Virat Kohli and co now travel to New Zealand for a limited-overs only tour, consisting of five ODIs and three T20Is. The last time the Men in Blue toured the Kiwi nation was in 2014, when the hosts outplayed the visitors 4-0 in the five-match ODI series with one match being tied. Virat Kohli and Ross Taylor will vie to prove they are the world's best one-day international batsman as India and New Zealand clash in the first of five ODIs in Napier on Wednesday. For both sides, the series is an opportunity to fine-tune planning ahead of the World Cup. Meanwhile, The McLean Park wicket promises to be a belter, with New Zealand's Tom Latham showing just how ripe the pitch is by smashing 110 off just 60 deliveries, including 10 fours and six sixes, in a domestic Twenty20 match last week. The hosts go into this series with Taylor fresh from scoring 54, 90 and 137 in the 3-0 whitewash of Sri Lanka, while Kohli produced innings of three, 104 and 46 in the 2-1 series win against Australia. Meanwhile, the visitors will continue to miss the services of Hardik Pandya, who was suspended after making controversial comments in ‘Koffee with Karan’, a chat show earlier this month.